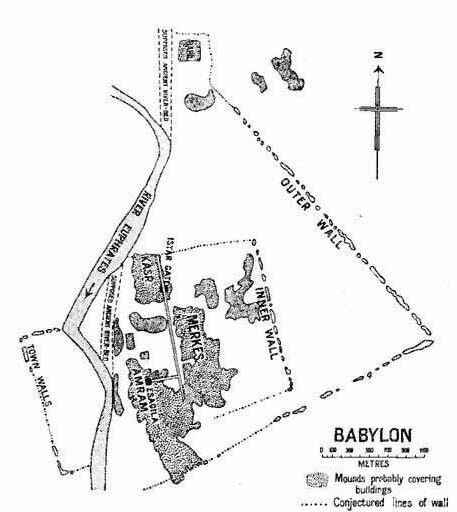 Babylon, about 85 kilometers south of Baghdad, was one of the great capitals of the ancient world (and most closely associated with King Nebuchadnezzar II, 605-562 BC); but it is also a center-point for myths and stories. The construction activities by Nebuchadrezzar II surpassed those of most of the Assyrian kings in the history of Mesopotamia. He fortified the old double walls of Babylon, adding another triple wall outside the old wall. 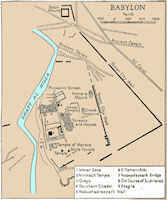 In addition, he erected another wall, the Median Wall, north of the city between the Euphrates and the Tigris rivers. According to Greek estimates, the Median Wall may have been about 100 feet high. He enlarged the old palace and added many. The walls which enclosed and guarded the whole - or which, perhaps one should rather say, guarded the district within which Babylon was placed-were remarkable for their great extent. Like the Hanging Gardens, they were included among the " world's seven wonders," and, according to every account given of them, their magnitude and construction were remarkable. According to the lowest of the ancient estimates, the entire length of the walls was 360 stades, or more than fortyone miles. With respect to the width, we have two very different statements, one by Herodotus' and the other by Clitarchus and Strabo. Herodotus makes the width fifty royal cubits or about eighty-five English feet; Strabo and Q.Curtius reduced the estimate to thirty-two feet. There is still greater discrepancy with respect to the height of the walls. Herodotus says that the height was 200 royal cubits, or 300 royal feet (about 335 English); Ctesias made it fifty fathoms or 300 ordinary Greek feet; Pliny and Solinus, substituting feet for the royal cubits of Herodotus, made the altitude 235 feet; Philostratus and Q\ Curtius, following perhaps some one of Alexander's historians, gave for the height 150 feet; finally Clitarchus, as reported by Diodorus Siculus, and Strabo, who probably followed him, have left us the very moderate estimate of seventy-five feet. It is impossible to reconcile these numbers. The supposition that some of them belonged properly to the outer, and others to the inner wall, will not explain the discrepancies-for the measurements cannot by any ingenuity be reduced to two sets of dimensions. The only conclusion which it seems possible to draw from the conflicting testimony is that the numbers were either rough guesses made by very unskilful travellers, or else were (in most cases) intentional exaggerations palmed upon them by the native ciceroni. Still the broad facts remain-first, that the walls enclosed an enormous space, which was very partially occupied by buildings; secondly, that they were of great and unusual thickness; and thirdly, that they were of a vast height-seventy or eighty feet at least in the time of Alexander after the wear and tear of centuries and the violence of at least three conquerors. The general character of the construction is open to but little doubt. The wall was made of bricks, either baked in kilns, or (more probably) dried in the sun, and laid in a cement of bitumen, with occasional layers of reeds between the courses. Externally it was protected by a wide and deep moat. On the summit were low towers, rising above the wall to the height of some ten or fifteen feet, and probably serving as guard-rooms for the defenders. These towers are said to have been 250 in number; they were at least numerous on the western face of the city, where the wall ran along the marshes. 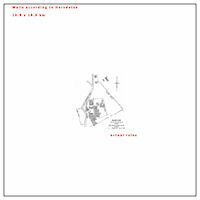 They were probably angular, not round; and, Instead of extending through the whole thickness of the wall, they were placed along its outer and inner edge, tower facing tower, with a wide space between them-" enough," Herodotus says, "for a four-horse chariot to turn in. The wall did not depend on them for its strength, but on its own height and thickness, which were such as to render scaling and mining equally hopeless." The Greek historian Herodotus may or may not have visited the city of Babylon in 460 BC, after it had been conquered by the Persian Cyrus, and stripped or treasures, but when its walls and temples were still standing, and he described the largest city of the ancient world. The entire city was said to be enclosed within a wall from 10.5 to 14 to miles [16.8 km to 22.5 km] on each side (depending on which ancient historian is referenced). The river Euphrates passed through the city walls, and the brick lined channel was lined by waterfront, wharves, and docks along its length inside the city. Herodotus stated the walls were 85 feet wide, and 335 feet tall, topped by 250 defensive towers. The top of the walls included a road wide enough that a four horse chariot could turn around on the road. 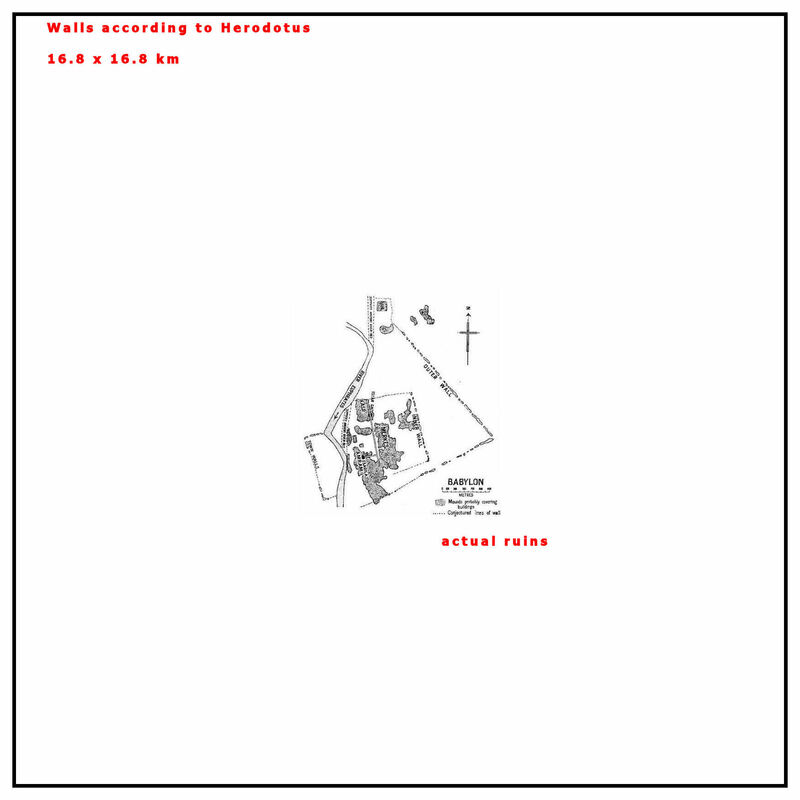 The supposed height of the walls was improbable, as it is unlikely that mud-brick construction material described would have been solid enough to support the weight of such a structure, and exploration has shown that the length of this wall seems to have been closer to twelve miles around. The Ishtar Gate, one of the eight gates of the inner city of Babylon, was built during the reign of Nebuchadnezzar II (604- 562 BC). The gateway has been reconstructed in the Pergamon Museum, Berlin, from the glazed bricks found, so its original height is different in size. The actual Ishtar gate had a total height of 47 feet and a width of 32 Feet. The actual ruins of the city are about 3.5 km by 5.0 km. So generally, the dimensions given by Herodotus are about five to ten times larger than those of the actual Babylon. Herodotus related that each of the four walls were pierced by 25 fortified gates, each guarded by massive bronze gates, through which the 50 thoroughfares of the city passed, forming 625 regular city blocks, each of at least 100 acres. The famous Ishtar Gate was a gated entrance to an inner wall in the city. 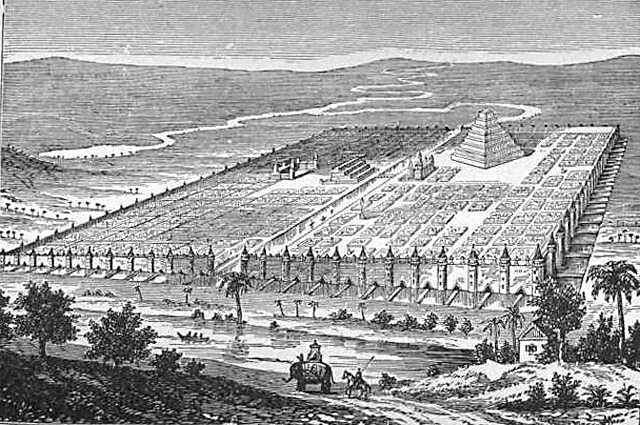 The area inside the walls included gardens and farms, as well as buildings and a full size pyramid, all made of bricks and palm wood. The walls were said to enclose up to 196 square miles. The step pyramid was the temple of Belus. It was 600 feet on each side at the base, and rose to a height of 480 feet, which compares to the 481 feet of the Egyptian pyramid at Giza. In all Nebuchadrezzar's inscriptions that have been found - and there are a great many - he especially glories in his constructions. But what he did at Babylon not only surpasses all his other works, but eclipses those of all former kings, even those of Sargon at Dur-Sharrukin, not so much in splendor as in the vastness and originality of his conceptions,-an originality due probably to that besetting idea of coupling adornment with military requirements, which consistently underlies most of the public works he undertook. In this, however, he appears to have followed a line traced out first by his father. Of some of his greatest constructions,- such as the new palace, the great city walls, and the embankments of the Euphrates,-he especially mentions that they were begun by Nabopolassar, but left unfinished at his death. 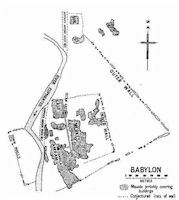 Babylon, sacked once by Sennacherib, then rebuilt by Esarhaddon, had gone through a conflagration when besieged and taken by Asshurbanipal, and must have been in a sad condition when the Chaldean usurper made it once more the seat of empire. Hence, perhaps, the thought of reconstructing it in such a manner as would make it a capital not only in size and magnificence, but in strength: it was to be at once the queen of cities and the most impregnable of fortresses. The last time that Babylon had been taken it had been reduced by famine. This was the first contingency to be guarded against. 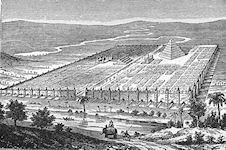 For this purpose the city was to be protected by a double enclosure of mighty walls, the inner one skirting its outlines narrowly, while the outer was moved to such a distance as to enfold a large portion of the land, which was to be cultivated so that the capital could raise enough grain and fodder for its own consumption. This vast space also would serve to shelter the population of the surrounding villages in case of an invasion. 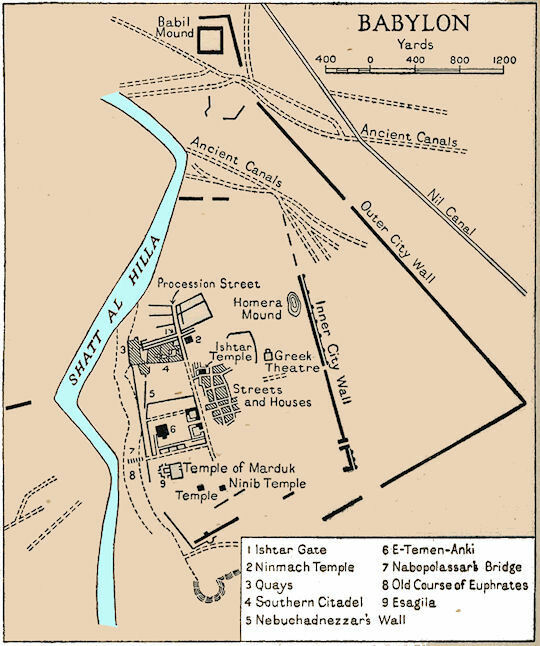 It has not been possible to trace the line of this outer wall, which received the name of NIMIT-TI-BEL, nor consequently to determine how many square miles it protected, and the reports of ancient writers are conflicting, as none of them, of course, took exact scientific measurements after the manner of modern surveyors. Herodotus gives the circumference as somewhat over fifty English miles [80 km]. A large figure certainly. But it has been observed that it scarcely surpasses that yielded by the circumvallation of Paris ; and besides the arable and pasture land, it must have embraced suburbs, not impossibly Borsip itself, which was also well fortified at the same time. This is the highest estimate. The lowest (and later) gives forty miles [about 60 km], but all these estimates vastly exceed what is found in the historical record. The Nimit-ti-Bel rampart was protected on the outside by a wide and deep moat, which at the same time had supplied the material for the wall. In mentioning it Herodotus stops to give a very faithful and vivid account of the local mode of construction, now so familiar to us, but which, when described to him, seems to have considerably astonished him : "And here I may not omit to tell the use to which the mould dug out of the great moat was turned, nor the manner wherein the wall was wrought. As fast as they dug the moat, the soil which they got from the cutting was made into bricks, and when a sufficient number were completed, they baked the bricks in kilns. Then they set to building and began with bricking the borders of the moat, after which they proceeded to construct the wall itself, using throughout for their cement hot bitumen, and interposing a layer of wattled reeds at every thirtieth course of the bricks." The reports about the height and thickness of this celebrated wall vary still more considerably. Herodotus says it was 350 feet high (apparently including the height of the towers, which were built at regular intervals on the top of it), with a thickness of 75 feet. Now no effort of imagination, even with the knowledge that the walls of Babylon were numbered among the "Seven Wonders of the World," can realize a city wall, nigh on fifty miles long, surpassing in height the extreme height of St. Paul's of London. The estimates of various later writers range all the way between that exorbitant figure and that of 75 feet - very possibly too moderate. For the fact remains undisputed that the Nimit-ti-Bel rampart was stupendous both in height and in thickness; that towers were built on the top of it, on the edges, two facing each other, and that there remained room between for a four-horsed chariot to turn. And the contemporary Hebrew prophet, Jeremiah, speaks of Babylon as "mounting up to heaven," of "the broad walls of Babylon " and her "high gates." Of these there were a hundred in the circuit of the wall, according to Herodotus, "and they were all of brass, with brazen lintels and side-posts." This outer wall Herodotus calls " the main defence of the city." The second or inner wall, named IMGUR-BEL, he described as being " of less thickness than the first, but very little inferior to it in strength." Then there were the walls which enclosed the two royal palaces, the old one on the right bank of the Euphrates, and the new one on the left,-and made of each a respectable fortress; for it was part of the plan of reconstruction that the city should be extended across the river, to gain a firmer seat and full control of this all-important thoroughfare; and an entire new quarter was built on the left bank around the new and magnificent palace.